Very important remark: Please inform engine model and Serial Number. The serial number of the engine is absolutely necessary information. If you do not see the item you are looking for, please write email to brovertek@gmail.com. May be we will be able to assist you. 178011 6R183TD13H MTU 6 cylinder diesel engines 6R 183 TD13H Maintenance (Service / Repair) Manual and Technical information, Spare parts catalog, Operation manual. 178012 V183AA31 MTU 10 cylinder diesel engines 10V 183 AA31 Maintenance (Service / Repair) Manual and Technical information, Spare parts catalog, Operation manual. 178013 V183AA51 MTU 6, 8, 10 and 12 cylinder diesel engines 6V 183 AA51, 8V 183 AA51, 10V 183 AA51, 12V 183 AA51 Maintenance (Service / Repair) Manual and Technical information, Spare parts catalog, Operation manual. 178014 V183AA61 MTU 6, 10 and 12 cylinder diesel engines 6V 183 AA61, 10V 183 AA61, 12V 183 AA61 Maintenance (Service / Repair) Manual and Technical information, Spare parts catalog, Operation manual. 178015 V183AA91 MTU 6, and 12 cylinder diesel engines 6V 183 AA91, 12V 183 AA91 Maintenance (Service / Repair) Manual and Technical information, Spare parts catalog, Operation manual. 178016 V183TA12 MTU 12 cylinder diesel engine 12V 183 TA12 Maintenance (Service / Repair) Manual and Technical information, Spare parts catalog, Operation manual. 178017 V183TA31 MTU 8 and 12 cylinder diesel engines 8V 183 TA31, 12V 183 TA31 Maintenance (Service / Repair) Manual and Technical information, Spare parts catalog, Operation manual. 178018 V183TA32 MTU 8 and 12 cylinder diesel engines 8V 183 TA32, 12V 183 TA32 Maintenance (Service / Repair) Manual and Technical information, Spare parts catalog, Operation manual. 178019 V183TA51 MTU 12 cylinder diesel engine 12V 183 TA51 Maintenance (Service / Repair) Manual and Technical information, Spare parts catalog, Operation manual. 178020 V183TA61 MTU 12 cylinder diesel engine 12V 183 TA61 Maintenance (Service / Repair) Manual and Technical information, Spare parts catalog, Operation manual. 178021 V183TA91 MTU 12 cylinder diesel engine 12V 183 TA91 Maintenance (Service / Repair) Manual and Technical information, Spare parts catalog, Operation manual. 178022 V183TB13 MTU 12 cylinder diesel engine 12V 183 TB13 Maintenance (Service / Repair) Manual and Technical information, Spare parts catalog, Operation manual. 178023 V183TB32 MTU 12 cylinder diesel engine 12V 183 TB32 Maintenance (Service / Repair) Manual and Technical information, Spare parts catalog, Operation manual. 178024 V183TC12 MTU 8 and 12 cylinder diesel engines 8V 183 TC12, 12V 183 TC12 Maintenance (Service / Repair) Manual and Technical information, Spare parts catalog, Operation manual. 178025 V183TC51 MTU 12 cylinder diesel engine 12V 183 TC51 Maintenance (Service / Repair) Manual and Technical information, Spare parts catalog, Operation manual. 178026 V183TC61 MTU 12 cylinder diesel engine 12V 183 TC61 Maintenance (Service / Repair) Manual and Technical information, Spare parts catalog, Operation manual. 178027 V183TC91 MTU 12 cylinder diesel engine 12V 183 TC91 Maintenance (Service / Repair) Manual and Technical information, Spare parts catalog, Operation manual. 178028 V183TD12 MTU 12 cylinder diesel engine 12V 183 TD12 Maintenance (Service / Repair) Manual and Technical information, Spare parts catalog, Operation manual. 178029 V183TD13 MTU 8 and 12 cylinder diesel engines 8V 183 TD13, 12V 183 TD13 Maintenance (Service / Repair) Manual and Technical information, Spare parts catalog, Operation manual. 178030 V183TE22 MTU 8 cylinder diesel engines 8V 183 TE22 Maintenance (Service / Repair) Manual and Technical information, Spare parts catalog, Operation manual. 178031 V183TE51 MTU 12 cylinder diesel engine 12V 183 TE51 Maintenance (Service / Repair) Manual and Technical information, Spare parts catalog, Operation manual. 178032 V183TE52 MTU 8 and 12 cylinder diesel engines 8V 183 TE52, 12V 183 TE52 Maintenance (Service / Repair) Manual and Technical information, Spare parts catalog, Operation manual. 178033 V183TE52K MTU 12 cylinder diesel engine 12V 183 TE52K Maintenance (Service / Repair) Manual and Technical information, Spare parts catalog, Operation manual. 178034 V183TE61 MTU 12 cylinder diesel engine 12V 183 TE61 Maintenance (Service / Repair) Manual and Technical information, Spare parts catalog, Operation manual. 178035 V183TE62 MTU 8 and 12 cylinder diesel engines 8V 183 TE62, 12V 183 TE62 Maintenance (Service / Repair) Manual and Technical information, Spare parts catalog, Operation manual. 178036 V183TE72 MTU 8 and 12 cylinder diesel engines 8V 183 TE72, 12V 183 TE72 Maintenance (Service / Repair) Manual and Technical information, Spare parts catalog, Operation manual. 178037 V183TE91 MTU 12 cylinder diesel engine 12V 183 TE91 Maintenance (Service / Repair) Manual and Technical information, Spare parts catalog, Operation manual. 178038 V183TE92 MTU 8 and 12 cylinder diesel engines 8V 183 TE92, 12V 183 TE92 Maintenance (Service / Repair) Manual and Technical information, Spare parts catalog, Operation manual. 178039 V183TE93 MTU 8 and 12 cylinder diesel engines 8V 183 TE93, 12V 183 TE93 Maintenance (Service / Repair) Manual and Technical information, Spare parts catalog, Operation manual. 178040 V183TE94 MTU 12 cylinder diesel engine 12V 183 TE94 Maintenance (Service / Repair) Manual and Technical information, Spare parts catalog, Operation manual. 178041 G6R183A MTU gas engine G6R 183 A Maintenance (Service / Repair) Manual and Technical information, Spare parts catalog, Operation manual. 178042 G8V183A MTU gas engine G8V 183 A Maintenance (Service / Repair) Manual and Technical information, Spare parts catalog, Operation manual. 178043 G12V183A MTU gas engine G12V 183 A Maintenance (Service / Repair) Manual and Technical information, Spare parts catalog, Operation manual. 178111 12V331TB82 MTU 12 cylinder diesel engine 12V 331 TB82 Spare parts catalog. 178112 12V331TC82 MTU 12 cylinder diesel engines TC82, 12V 331 TC82 Spare parts catalog. 178113 12V331TC92 MTU 12 cylinder diesel engines 12V 331 TC92 Spare parts catalog. 178121 V396LTE74L MTU 8 cylinder diesel engines 8V 396 LTE 74L Maintenance (Service / Repair) Manual and Technical information, Spare parts catalog, Operation manual. 178122 V396SE84 MTU 8, 12 and 16 cylinder diesel engines 8V 396 SE84, 12V 396S E84, 16V 396 SE84 Maintenance (Service / Repair) Manual and Technical information, Spare parts catalog, Operation manual. 178123 V396TB14 MTU 8, 12 and 16 cylinder diesel engines 8V 396 TB14, 12V 396 TB14, 16V 396 TB14 Maintenance (Service / Repair) Manual and Technical information, Spare parts catalog, Operation manual. 178124 V396TB34 MTU 6, 8, 12 and 16 cylinder diesel engines 6V 396 TB34, 8V 396 TB34, 12V 396 TB34, 16V 396 TB34 Maintenance (Service / Repair) Manual and Technical information, Spare parts catalog, Operation manual. 178125 V396TB34D MTU 8, 12 and 16 cylinder diesel engines 8V 396 TB34 D, 12V 396 TB34 D, 16V 396 TB34 D Maintenance (Service / Repair) Manual and Technical information, Spare parts catalog, Operation manual. 178126 V396TB34R MTU 8, 12 and 16 cylinder diesel engines 8V 396 TB34 R, 12V 396 TB34 R, 16V 396 TB34 R Maintenance (Service / Repair) Manual and Technical information, Spare parts catalog, Operation manual. 178127 V396TB44L MTU 16 cylinder diesel engines 16V 396 TB44 L Maintenance (Service / Repair) Manual and Technical information, Spare parts catalog, Operation manual. 178128 V396TB53 MTU 6 cylinder diesel engines 6V 396 TB53 Maintenance (Service / Repair) Manual and Technical information, Spare parts catalog, Operation manual. 178129 V396TB82 MTU 12 cylinder diesel engines 12V 396 TB82 Maintenance (Service / Repair) Manual and Technical information, Spare parts catalog, Operation manual. 178130 V396TB83 MTU 6 and 8 cylinder diesel engines 6V 396 TB83, 8V 396 TB83 Maintenance (Service / Repair) Manual and Technical information, Spare parts catalog, Operation manual. 178131 V396TB84 MTU 12 and 16 cylinder diesel engines 12V 396 TB84, 16V 396 TB84 Maintenance (Service / Repair) Manual and Technical information, Spare parts catalog, Operation manual. 178132 V396TB93 MTU 12 cylinder diesel engines 12V 396 TB93 Maintenance (Service / Repair) Manual and Technical information, Spare parts catalog, Operation manual. 178133 V396TB94 MTU 12 and 16 cylinder diesel engines 12V 396 TB94, 16V 396 TB94 Maintenance (Service / Repair) Manual and Technical information, Spare parts catalog, Operation manual. 178134 V396TC12 MTU 6, 8 and 12 cylinder diesel engines 6V 396 TC12, 8V 396 TC12, 12V 396 TC12 Maintenance (Service / Repair) Manual and Technical information, Spare parts catalog, Operation manual. 178135 V396TC13 MTU 6, 8 and 12 cylinder diesel engines 6V 396 TC13, 8V 396 TC13, 12V 396 TC13 Maintenance (Service / Repair) Manual and Technical information, Spare parts catalog, Operation manual. 178136 V396TC14 MTU 8, 12 and 16 cylinder diesel engines 8V 396 TC14, 12V 396 TC14, 16V 396 TC14 Maintenance (Service / Repair) Manual and Technical information, Spare parts catalog, Operation manual. 178137 V396TC32 MTU 12 cylinder diesel engines 12V 396 TC32 Maintenance (Service / Repair) Manual and Technical information, Spare parts catalog, Operation manual. 178138 V396TC33 MTU 8 and 12 cylinder diesel engines 8V 396 TC33, 12V 396 TC33 Maintenance (Service / Repair) Manual and Technical information, Spare parts catalog, Operation manual. 178139 V396TC34 MTU 6, 8, 12 and 16 cylinder diesel engines 6V 396 TC34, 8V 396 TC34, 12V 396 TC34, 16V 396 TC34 Maintenance (Service / Repair) Manual and Technical information, Spare parts catalog, Operation manual. 178140 V396TC34D MTU 8, 12 and 16 cylinder diesel engines 8V 396 TC34 D, 12V 396 TC34 D, 16V 396 TC34 D Maintenance (Service / Repair) Manual and Technical information, Spare parts catalog, Operation manual. 178141 V396TC34R MTU 8 cylinder diesel engines 8V 396 TC34 R Maintenance (Service / Repair) Manual and Technical information, Spare parts catalog, Operation manual. 178142 V396TC43 MTU 12 cylinder diesel engines 12V 396 TC43 Maintenance (Service / Repair) Manual and Technical information, Spare parts catalog, Operation manual. 178143 V396TC52 MTU 6 and 8 cylinder diesel engines 6V 396 TC52, 8V 396 TC52 Maintenance (Service / Repair) Manual and Technical information, Spare parts catalog, Operation manual. 178144 V396TC52Z MTU 6 and 8 cylinder diesel engines 6V 396 TC52 Z, 8V 396 TC52 Z Maintenance (Service / Repair) Manual and Technical information, Spare parts catalog, Operation manual. 178145 V396TC54 MTU 8 and 12 cylinder diesel engines 8V 396 TC54, 12V 396 TC54 Maintenance (Service / Repair) Manual and Technical information, Spare parts catalog, Operation manual. 178146 V396TC64 MTU 8 cylinder diesel engines 8V 396 TC64 Maintenance (Service / Repair) Manual and Technical information, Spare parts catalog, Operation manual. 178147 V396TC82K MTU 12 cylinder diesel engines 12V 396 TC82 K Maintenance (Service / Repair) Manual and Technical information, Spare parts catalog, Operation manual. 178148 V396TC92 MTU 12 cylinder diesel engines 12V 396 TC92 Maintenance (Service / Repair) Manual and Technical information, Spare parts catalog, Operation manual. 178149 V396TC94 MTU 8, 12 and 16 cylinder diesel engines 8V 396 TC94, 12V 396 TC94, 16V 396 TC94 Maintenance (Service / Repair) Manual and Technical information, Spare parts catalog, Operation manual. 178150 V396TE14 MTU 12 and 16 cylinder diesel engines 12V 396 TE14, 16V 396 TE14 Maintenance (Service / Repair) Manual and Technical information, Spare parts catalog, Operation manual. 178151 V396TE34 MTU 8, 12 and 16 cylinder diesel engines 8V 396 TE34, 12V 396 TE34, 16V 396 TE34 Maintenance (Service / Repair) Manual and Technical information, Spare parts catalog, Operation manual. 178152 V396TE34D MTU 16 cylinder diesel engines 16V 396 TE34 D Maintenance (Service / Repair) Manual and Technical information, Spare parts catalog, Operation manual. 178153 V396TE34L MTU 16 cylinder diesel engines 16V 396 TE34 L Maintenance (Service / Repair) Manual and Technical information, Spare parts catalog, Operation manual. 178154 V396TE44 MTU 16 cylinder diesel engines 16V 396 TE44 Maintenance (Service / Repair) Manual and Technical information, Spare parts catalog, Operation manual. 178155 V396TE54 MTU 8, 12 and 16 cylinder diesel engines 8V 396 TE54, 12V 396 TE54, 16V 396 TE54 Maintenance (Service / Repair) Manual and Technical information, Spare parts catalog, Operation manual. 178156 V396TE64 MTU 8, 12 and 16 cylinder diesel engines 8V 396 TE64, 12V 396 TE64, 16V 396 TE64 Maintenance (Service / Repair) Manual and Technical information, Spare parts catalog, Operation manual. 178157 V396TE74 MTU 8, 12 and 16 cylinder diesel engines 8V 396 TE74, 12V 396 TE74, 16V 396 TE74 Maintenance (Service / Repair) Manual and Technical information, Spare parts catalog, Operation manual. 178158 V396TE74K MTU 8 cylinder diesel engines 8V 396 TE74 K Maintenance (Service / Repair) Manual and Technical information, Spare parts catalog, Operation manual. 178159 V396TE74L MTU 8, 12 and 16 cylinder diesel engines 8V 396 TE74 L, 12V 396 TE74 L, 16V 396 TE74 L Maintenance (Service / Repair) Manual and Technical information, Spare parts catalog, Operation manual. 178160 V396TE84 MTU 8, 12 and 16 cylinder diesel engines 8V 396 TE84, 12V 396 TE84, 16V 396 TE84 Maintenance (Service / Repair) Manual and Technical information, Spare parts catalog, Operation manual. 178161 V396TE84K MTU 8 and 12 cylinder diesel engines 8V 396 TE84 K, 12V 396 TE84 K Maintenance (Service / Repair) Manual and Technical information, Spare parts catalog, Operation manual. 178162 V396TE94 MTU 8, 12 and 16 cylinder diesel engines 8V 396 TE94, 12V 396 TE94, 16V 396 TE94 Maintenance (Service / Repair) Manual and Technical information, Spare parts catalog, Operation manual. 178211 12V493TY10 MTU 12 cylinder diesel engine 12V 493 TY10 Maintenance (Service / Repair) Manual and Technical information, Spare parts catalog, Operation manual. 178212 12V493TY30 MTU 12 cylinder diesel engine 12V 493 TY30 Maintenance (Service / Repair) Manual and Technical information, Spare parts catalog, Operation manual. 178213 12V493TY60 MTU 12 cylinder diesel engine 12V 493 TY60 Maintenance (Service / Repair) Manual and Technical information, Spare parts catalog, Operation manual. 178214 12V493TY70 MTU 12 cylinder diesel engine 12V 493 TY70 Maintenance (Service / Repair) Manual and Technical information, Spare parts catalog, Operation manual. 178221 16V538TB93 MTU 16 cylinder diesel engines 16V 538 TB93 Maintenance (Service / Repair) Manual and Technical information, Spare parts catalog, Operation manual. 178231 12V956TB32 MTU 12 cylinder diesel engine 12V 956 TB32 Maintenance (Service / Repair) Manual and Technical information, Spare parts catalog, Operation manual. 178232 12V956TB33 MTU 12 cylinder diesel engine 12V 956 TB33 Maintenance (Service / Repair) Manual and Technical information, Spare parts catalog, Operation manual. 178233 16V956TB82 MTU 16 cylinder diesel engine 16V 956 TB82 Maintenance (Service / Repair) Manual and Technical information, Spare parts catalog, Operation manual. 178234 12V956TB83 MTU 12 cylinder diesel engine 12V 956 TB83 Maintenance (Service / Repair) Manual and Technical information, Spare parts catalog, Operation manual. 178235 16V956TB92 MTU 16 cylinder diesel engine 16V 956 TB92 Maintenance (Service / Repair) Manual and Technical information, Spare parts catalog, Operation manual. 178236 12V956TB93 MTU 12 cylinder diesel engine 12V 956 TB93 Maintenance (Service / Repair) Manual and Technical information, Spare parts catalog, Operation manual. 178261 12V1163TB33 MTU 12 cylinder diesel engines 12V 1163 TB33 Maintenance (Service / Repair) Manual and Technical information, Spare parts catalog, Operation manual. 178262 12V1163TB73 MTU 12 cylinder diesel engines 12V 1163 TB73 Maintenance (Service / Repair) Manual and Technical information, Spare parts catalog, Operation manual. 178263 16V1163TB73L MTU 12 cylinder diesel engines 12V 1163 TB73L Maintenance (Service / Repair) Manual and Technical information, Spare parts catalog, Operation manual. 178264 12V1163TB83 MTU 12 cylinder diesel engines 12V 1163 TB83 Maintenance (Service / Repair) Manual and Technical information, Spare parts catalog, Operation manual. 178265 12V1163TB93 MTU 12 cylinder diesel engines 12V 1163 TB93 Maintenance (Service / Repair) Manual and Technical information, Spare parts catalog, Operation manual. 178310 6R1600B30S MTU 6 cylinder in-line diesel engines 6R 1600 B30S Maintenance (Service / Repair) Manual and Technical information, Spare parts catalog, Operation manual. 178311 6R1600B40S MTU 6 cylinder in-line diesel engines 6R 1600 B40S Maintenance (Service / Repair) Manual and Technical information, Spare parts catalog, Operation manual. 178312 6R1600G10F MTU 6 cylinder in-line diesel engines 6R 1600 G10F Maintenance (Service / Repair) Manual and Technical information, Spare parts catalog, Operation manual. 178313 6R1600G10S MTU 6 cylinder in-line diesel engines 6R 1600 G10S Maintenance (Service / Repair) Manual and Technical information, Spare parts catalog, Operation manual. 178314 6R1600G20F MTU 6 cylinder in-line diesel engines 6R 1600 G20F Maintenance (Service / Repair) Manual and Technical information, Spare parts catalog, Operation manual. 178315 6R1600G20S MTU 6 cylinder in-line diesel engines 6R 1600 G20S Maintenance (Service / Repair) Manual and Technical information, Spare parts catalog, Operation manual. 178316 6R1600G40F MTU 6 cylinder in-line diesel engines 6R 1600 G40F Maintenance (Service / Repair) Manual and Technical information, Spare parts catalog, Operation manual. 178317 6R1600G50F MTU 6 cylinder in-line diesel engines 6R 1600 G50F Maintenance (Service / Repair) Manual and Technical information, Spare parts catalog, Operation manual. 178318 6R1600G70F MTU 6 cylinder in-line diesel engines 6R 1600 G70F Maintenance (Service / Repair) Manual and Technical information, Spare parts catalog, Operation manual. 178319 6R1600G70S MTU 6 cylinder in-line diesel engines 6R 1600 G70S Maintenance (Service / Repair) Manual and Technical information, Spare parts catalog, Operation manual. 178320 6R1600G80F MTU 6 cylinder in-line diesel engines 6R 1600 G80F Maintenance (Service / Repair) Manual and Technical information, Spare parts catalog, Operation manual. 178321 6R1600G80S MTU 6 cylinder in-line diesel engines 6R 1600 G80S Maintenance (Service / Repair) Manual and Technical information, Spare parts catalog, Operation manual. 178322 V1600B30S MTU 8 and 12 cylinder diesel engines 8 V 1600 B30S, 12 V 1600 B30S Maintenance (Service / Repair) Manual and Technical information, Spare parts catalog, Operation manual. 178323 V1600B40S MTU 8, 10 and 12 cylinder diesel engines 8 V 1600 B40S, 10 V 1600 B40S, 12 V 1600 B40S Maintenance (Service / Repair) Manual and Technical information, Spare parts catalog, Operation manual. 178324 V1600B50F MTU 8 and 10 cylinder diesel engines 8 V 1600 B50F, 10 V 1600 B50F Maintenance (Service / Repair) Manual and Technical information, Spare parts catalog, Operation manual. 178325 V1600G10F MTU 8, 10 and 12 cylinder diesel engines 8 V 1600 G10F, 10 V 1600 G10F, 12 V 1600 G10F Maintenance (Service / Repair) Manual and Technical information, Spare parts catalog, Operation manual. 178326 V1600G10S MTU 8, 10 and 12 cylinder diesel engines 8 V 1600 G10S, 10 V 1600 G10S, 12 V 1600 G10S Maintenance (Service / Repair) Manual and Technical information, Spare parts catalog, Operation manual. 178327 V1600G20F MTU 8, 10 and 12 cylinder diesel engines 8 V 1600 G20F, 10 V 1600 G20F, 12 V 1600 G20F Maintenance (Service / Repair) Manual and Technical information, Spare parts catalog, Operation manual. 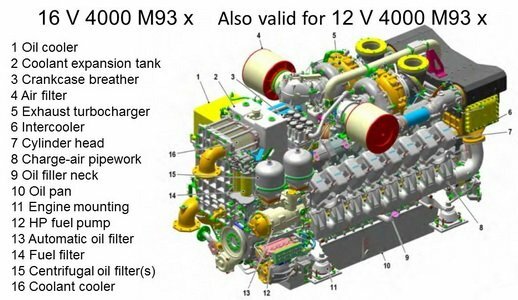 178328 V1600G20S MTU 8, 10 and 12 cylinder diesel engines 8 V 1600 G20S, 10 V 1600 G20S, 12 V 1600 G20S Maintenance (Service / Repair) Manual and Technical information, Spare parts catalog, Operation manual. 178329 V1600G40F MTU 8, 10 and 12 cylinder diesel engines 8 V 1600 G40F, 10 V 1600 G40F, 12 V 1600 G40F Maintenance (Service / Repair) Manual and Technical information, Spare parts catalog, Operation manual. 178330 V1600G50F MTU 8, 10 and 12 cylinder diesel engines 8 V 1600 G50F, 10 V 1600 G50F, 12 V 1600 G50F Maintenance (Service / Repair) Manual and Technical information, Spare parts catalog, Operation manual. 178331 V1600G70F MTU 8, 10 and 12 cylinder diesel engines 8 V 1600 G70F, 10 V 1600 G70F, 12 V 1600 G70F Maintenance (Service / Repair) Manual and Technical information, Spare parts catalog, Operation manual. 178332 V1600G70S MTU 8, 10 and 12 cylinder diesel engines 8 V 1600 G70S, 10 V 1600 G70S, 12 V 1600 G70S Maintenance (Service / Repair) Manual and Technical information, Spare parts catalog, Operation manual. 178333 V1600G80F MTU 8, 10 and 12 cylinder diesel engines 8 V 1600 G80F, 10 V 1600 G80F, 12 V 1600 G80F Maintenance (Service / Repair) Manual and Technical information, Spare parts catalog, Operation manual. 178334 V1600G80S MTU 8, 10 and 12 cylinder diesel engines 8 V 1600 G80S, 10 V 1600 G80S, 12 V 1600 G80S Maintenance (Service / Repair) Manual and Technical information, Spare parts catalog, Operation manual. 178335 12V1600R50 MTU 12 cylinder diesel engines 12 V 1600 R50 Maintenance (Service / Repair) Manual and Technical information, Spare parts catalog, Operation manual. 178410 V2000B16F MTU 12, 16, and 18 cylinder diesel engines 12V 2000 B16 F, 16V 2000 B16 F, F18 V2000 B16 F Maintenance (Service / Repair) Manual and Technical information, Spare parts catalog, Operation manual. 178411 V2000B76 switchable MTU switchable 12, 16, and 18 cylinder diesel engines 12V 2000 B76, 16V 2000 B76, F18 V2000 B76 Maintenance (Service / Repair) Manual and Technical information, Spare parts catalog, Operation manual. 178412 V2000C MTU switchable 8, 12, and 16 cylinder diesel engines 8V 2000 C, 12V 2000 C, 16V 2000 C Maintenance (Service / Repair) Manual and Technical information, Spare parts catalog, Operation manual. 178413 V2000G MTU 8 cylinder diesel engines 8V 2000 G Maintenance (Service / Repair) Manual and Technical information, Spare parts catalog, Operation manual. 178414 V2000G02 MTU 12 and 16 cylinder diesel engines 12V 2000 G02, 16V 2000 G02 Maintenance (Service / Repair) Manual and Technical information, Spare parts catalog, Operation manual. 178415 V2000G16F MTU 12, 16 and 18 cylinder diesel engines 12V 2000 G16 F, 16V 2000 G16 F, 18V 2000 G16 F Maintenance (Service / Repair) Manual and Technical information, Spare parts catalog, Operation manual. 178416 V2000G20 MTU 8 cylinder diesel engines 8V 2000 G20 Maintenance (Service / Repair) Manual and Technical information, Spare parts catalog, Operation manual. 178417 V2000G22 MTU 12 and 16 cylinder diesel engines 12V 2000 G22, 16V 2000 G22 Maintenance (Service / Repair) Manual and Technical information, Spare parts catalog, Operation manual. 178418 V2000G23 MTU 12, 16 and 18 cylinder diesel engines 12V 2000 G23, 16V 2000 G23, 18V 2000 G23 Maintenance (Service / Repair) Manual and Technical information, Spare parts catalog, Operation manual. 178419 V2000G25 MTU 12, 16 and 18 cylinder diesel engines 12V 2000 G25 TB, 16V 2000 G25 TB, 18V 2000 G25 Maintenance (Service / Repair) Manual and Technical information, Spare parts catalog, Operation manual. 178420 V2000G26F MTU 12, 16 and 18 cylinder diesel engines 12V 2000 G26 F, 16V 2000 G26 F, 18V 2000 G26 F Maintenance (Service / Repair) Manual and Technical information, Spare parts catalog, Operation manual. 178421 V2000G36F MTU 12, 16 and 18 cylinder diesel engines 12V 2000 G36 F, 16V 2000 G36 F, 18V 2000 G36 F Maintenance (Service / Repair) Manual and Technical information, Spare parts catalog, Operation manual. 178422 V2000G42 MTU 12 and 16 cylinder diesel engines 12V 2000 G42, 16V 2000 G42 Maintenance (Service / Repair) Manual and Technical information, Spare parts catalog, Operation manual. 178423 V2000G43 MTU 12, 16 and 18 cylinder diesel engines 12V 2000 G43, 16V 2000 G43, 18V 2000 G43 Maintenance (Service / Repair) Manual and Technical information, Spare parts catalog, Operation manual. 178424 V2000G45 MTU 12, 16 and 18 cylinder diesel engines 12V 2000 G45 TB, 16V 2000 G45 TB, 18V 2000 G45 Maintenance (Service / Repair) Manual and Technical information, Spare parts catalog, Operation manual. 178425 V2000G60 MTU 12 and 16 cylinder diesel engines 12V 2000 G60, 16V 2000 G60 Maintenance (Service / Repair) Manual and Technical information, Spare parts catalog, Operation manual. 178426 V2000G62 MTU 12, 16 and 18 cylinder diesel engines 12V 2000 G62, 16V 2000 G62, 18V 2000 G62 Maintenance (Service / Repair) Manual and Technical information, Spare parts catalog, Operation manual. 178427 V2000G63 MTU 12, 16 and 18 cylinder diesel engines 12V 2000 G63, 16V 2000 G63, 18V 2000 G63 Maintenance (Service / Repair) Manual and Technical information, Spare parts catalog, Operation manual. 178428 V2000G65 MTU 12, 16 and 18 cylinder diesel engines 12V 2000 G65 TB, 16V 2000 G65 TB, 18V 2000 G65 TB Maintenance (Service / Repair) Manual and Technical information, Spare parts catalog, Operation manual. 178429 V2000G82 MTU 12, 16 and 18 cylinder diesel engines 12V 2000 G82, 16V 2000 G82, 18V 2000 G82 Maintenance (Service / Repair) Manual and Technical information, Spare parts catalog, Operation manual. 178430 V2000G83 MTU 12, 16 and 18 cylinder diesel engines 12V 2000 G83, 16V 2000 G83, 18V 2000 G83 Maintenance (Service / Repair) Manual and Technical information, Spare parts catalog, Operation manual. 178431 V2000G85 MTU 12, 16 and 18 cylinder diesel engines 12V 2000 G85 TB, 16V 2000 G85 TB, 18V 2000 G85 TB Maintenance (Service / Repair) Manual and Technical information, Spare parts catalog, Operation manual. 178432 V2000M40 MTU 12 and 16 cylinder diesel engines 12V 2000 M40, 16V 2000 M40 Maintenance (Service / Repair) Manual and Technical information, Spare parts catalog, Operation manual. 178433 V2000M40A MTU 8, 12 and 16 cylinder diesel engines 8V 2000 M40 A, 12V 2000 M40 A, 16V 2000 M40 A Maintenance (Service / Repair) Manual and Technical information, Spare parts catalog, Operation manual. 178434 V2000M40B MTU 8, 12 and 16 cylinder diesel engines 8V 2000 M40 B, 12V 2000 M40 B, 16V 2000 M40 B Maintenance (Service / Repair) Manual and Technical information, Spare parts catalog, Operation manual. 178435 V2000M41A MTU 12 and 16 cylinder diesel engines 12V 2000 M41 A, 16V 2000 M41 A Maintenance (Service / Repair) Manual and Technical information, Spare parts catalog, Operation manual. 178436 V2000M41B MTU 12 and 16 cylinder diesel engines 12V 2000 M41 B, 16V 2000 M41 B Maintenance (Service / Repair) Manual and Technical information, Spare parts catalog, Operation manual. 178437 V2000M50A MTU 8 and 12 cylinder diesel engines 8V 2000 M50 A, 12V 2000 M50 A Maintenance (Service / Repair) Manual and Technical information, Spare parts catalog, Operation manual. 178438 V2000M60 MTU 8, 12 and 16 cylinder diesel engines 8V 2000 M60, 12V 2000 M60, 16V 2000 M60 Maintenance (Service / Repair) Manual and Technical information, Spare parts catalog, Operation manual. 178439 V2000M60A MTU 12 cylinder diesel engines 12V 2000 M60 A Maintenance (Service / Repair) Manual and Technical information, Spare parts catalog, Operation manual. 178440 V2000M61 MTU 12 and 16 cylinder diesel engines 12V 2000 M61, 16V 2000 M61 Maintenance (Service / Repair) Manual and Technical information, Spare parts catalog, Operation manual. 178441 V2000M70 MTU 12 and 16 cylinder diesel engines 12V 2000 M70, 16V 2000 M70 Maintenance (Service / Repair) Manual and Technical information, Spare parts catalog, Operation manual. 178442 V2000M72 MTU 8, 10, 12 and 16 cylinder diesel engines 8V 2000 M72, 10V 2000 M72, 12V 2000 M72, 16V 2000 M72 Maintenance (Service / Repair) Manual and Technical information, Spare parts catalog, Operation manual. 178443 V2000M80 MTU 12 and 16 cylinder diesel engines 12V 2000 M80, 16V 2000 M80 Maintenance (Service / Repair) Manual and Technical information, Spare parts catalog, Operation manual. 178444 V2000M84 MTU 8 and 10 cylinder diesel engines 8V 2000 M84, 10V 2000 M84 Maintenance (Service / Repair) Manual and Technical information, Spare parts catalog, Operation manual. 178445 V2000M90 MTU 12 and 16 cylinder diesel engines 12V 2000 M90, 16V 2000 M90 Maintenance (Service / Repair) Manual and Technical information, Spare parts catalog, Operation manual. 178446 V2000M91 MTU 12 and 16 cylinder diesel engines 12V 2000 M91, 16V 2000 M91 Maintenance (Service / Repair) Manual and Technical information, Spare parts catalog, Operation manual. 178447 V2000M92 MTU 8, 10, 12 and 16 cylinder diesel engines 8V 2000 M92, 10V 2000 M92, 12V 2000 M92, 16V 2000 M92 Maintenance (Service / Repair) Manual and Technical information, Spare parts catalog, Operation manual. 178448 V2000M93 MTU 8, 10, 12 and 16 cylinder diesel engines 8V 2000 M93, 10V 2000 M93, 12V 2000 M93, 16V 2000 M93 Maintenance (Service / Repair) Manual and Technical information, Spare parts catalog, Operation manual. 178449 V2000N90 MTU 12 and 16 cylinder diesel engines 12V 2000 N90, 16V 2000 N90 Maintenance (Service / Repair) Manual and Technical information, Spare parts catalog, Operation manual. 178450 V2000P92 MTU 12 and 16 cylinder diesel engines 12V 2000 P92, 16V 2000 P92 Maintenance (Service / Repair) Manual and Technical information, Spare parts catalog, Operation manual. 178451 V2000P92R MTU 12 and 16 cylinder diesel engines 12V 2000 P92 R, 16V 2000 P92 R Maintenance (Service / Repair) Manual and Technical information, Spare parts catalog, Operation manual. 178452 V2000R80 MTU 12 cylinder diesel engines 12V 2000 R80 Maintenance (Service / Repair) Manual and Technical information, Spare parts catalog, Operation manual. 178453 V2000TE90 MTU 16 cylinder diesel engines 16V 2000 TE90 Maintenance (Service / Repair) Manual and Technical information, Spare parts catalog, Operation manual. 178510 V4000C20 MTU 12 and 16 cylinder diesel engines 12V 4000 C20, 16V 4000 C20, Maintenance (Service / Repair) Manual and Technical information, Spare parts catalog, Operation manual. 178511 V4000C21 MTU 12 and 16 cylinder diesel engines 12V 4000 C21, 16V 4000 C21, Maintenance (Service / Repair) Manual and Technical information, Spare parts catalog, Operation manual. 178512 V4000C22 MTU 20 cylinder diesel engine 20V 4000 C22 Maintenance (Service / Repair) Manual and Technical information, Spare parts catalog, Operation manual. 178513 V4000C41 MTU 8, 12 and 16 cylinder diesel engines 8V 4000 C41, 12V 4000 C41, 16V 4000 C41 Maintenance (Service / Repair) Manual and Technical information, Spare parts catalog, Operation manual. 178514 V4000C61 MTU 8, 12 and 16 cylinder diesel engines 8V 4000 C61, 12V 4000 C61, 16V 4000 C61 Maintenance (Service / Repair) Manual and Technical information, Spare parts catalog, Operation manual. 178515 V4000C81 MTU 8, 12 and 16 cylinder diesel engines 8V 4000 C81, 12V 4000 C81, 16V 4000 C81 Maintenance (Service / Repair) Manual and Technical information, Spare parts catalog, Operation manual. 178516 V4000E20 MTU 16 cylinder diesel engine 16V 4000 E20 Maintenance (Service / Repair) Manual and Technical information, Spare parts catalog, Operation manual. 178517 V4000G20 MTU 12 and 16 cylinder diesel engines 12V 4000 G20, 16V 4000 G20 Maintenance (Service / Repair) Manual and Technical information, Spare parts catalog, Operation manual. 178518 V4000G21 MTU 8, 12 and 16 cylinder diesel engines 8V 4000 G21, 12V 4000 G21, 16V 4000 G21 Maintenance (Service / Repair) Manual and Technical information, Spare parts catalog, Operation manual. 178519 V4000G22 MTU 20 cylinder diesel engine 20V 4000 G22 Maintenance (Service / Repair) Manual and Technical information, Spare parts catalog, Operation manual. 178520 V4000G23 MTU 12 and 16 cylinder diesel engines 12V 4000 G23, 16V 4000 G23 Maintenance (Service / Repair) Manual and Technical information, Spare parts catalog, Operation manual. 178521 V4000G23R MTU 12 cylinder diesel engine 12V 4000 G23 R Maintenance (Service / Repair) Manual and Technical information, Spare parts catalog, Operation manual. 178522 V4000G40 MTU 12 and 16 cylinder diesel engines 12V 4000 G40, 16V 4000 G40 Maintenance (Service / Repair) Manual and Technical information, Spare parts catalog, Operation manual. 178523 V4000G41 MTU 8, 12 and 16 cylinder diesel engines 8V 4000 G41, 12V 4000 G41, 16V 4000 G41 Maintenance (Service / Repair) Manual and Technical information, Spare parts catalog, Operation manual. 178524 V4000G42 MTU 20 cylinder diesel engine 20V 4000 G42 Maintenance (Service / Repair) Manual and Technical information, Spare parts catalog, Operation manual. 178525 V4000G43 MTU 12 and 16 cylinder diesel engines 12V 4000 G43, 16V 4000 G43 Maintenance (Service / Repair) Manual and Technical information, Spare parts catalog, Operation manual. 178526 V4000G60 MTU 8, 12 and 16 cylinder diesel engines 8V 4000 G60, 12V 4000 G60, 16V 4000 G60 Maintenance (Service / Repair) Manual and Technical information, Spare parts catalog, Operation manual. 178527 V4000G61 MTU 8, 12 and 16 cylinder diesel engines 8V 4000 G61, 12V 4000 G61, 16V 4000 G61 Maintenance (Service / Repair) Manual and Technical information, Spare parts catalog, Operation manual. 178528 V4000G62 MTU 20 cylinder diesel engine 20V 4000 G62 Maintenance (Service / Repair) Manual and Technical information, Spare parts catalog, Operation manual. 178529 V4000G63 MTU 12 and 16 cylinder diesel engines 12V 4000 G63, 16V 4000 G63 Maintenance (Service / Repair) Manual and Technical information, Spare parts catalog, Operation manual. 178530 V4000G73 MTU 12 cylinder diesel engine 12V 4000 G73 Maintenance (Service / Repair) Manual and Technical information, Spare parts catalog, Operation manual. 178531 V4000G80 MTU 12 and 16 cylinder diesel engines 12V 4000 G80, 16V 4000 G80 Maintenance (Service / Repair) Manual and Technical information, Spare parts catalog, Operation manual. 178532 V4000G81 MTU 8, 12 and 16 cylinder diesel engines 8V 4000 G81, 12V 4000 G81, 16V 4000 G81 Maintenance (Service / Repair) Manual and Technical information, Spare parts catalog, Operation manual. 178533 V4000G82 MTU 20 cylinder diesel engine 20V 4000 G82 Maintenance (Service / Repair) Manual and Technical information, Spare parts catalog, Operation manual. 178534 V4000G83 MTU 12 and 16 cylinder diesel engines 12V 4000 G83, 16V 4000 G83 Maintenance (Service / Repair) Manual and Technical information, Spare parts catalog, Operation manual. 178535 V4000M40A MTU 8 and 16 cylinder diesel engines 8V 4000 M40 A, 16V 4000 M40 A Maintenance (Service / Repair) Manual and Technical information, Spare parts catalog, Operation manual. 178536 V4000M50B MTU 16 cylinder diesel engine 16V 4000 M50 B Maintenance (Service / Repair) Manual and Technical information, Spare parts catalog, Operation manual. 178537 V4000M53 MTU 12 cylinder diesel engine 12V 4000 M53 Maintenance (Service / Repair) Manual and Technical information, Spare parts catalog, Operation manual. 178538 V4000M53R MTU 8 cylinder diesel engine 8V 4000 M53 R Maintenance (Service / Repair) Manual and Technical information, Spare parts catalog, Operation manual. 178539 V4000M60 MTU 8, 12 and 16 cylinder diesel engines 8V 4000 M60, 12V 4000 M60, 16V 4000 M60 Maintenance (Service / Repair) Manual and Technical information, Spare parts catalog, Operation manual. 178540 V4000M70 MTU 8 and 16 cylinder diesel engines 8V 4000 M70, 16V 4000 M70 Maintenance (Service / Repair) Manual and Technical information, Spare parts catalog, Operation manual. 178541 V4000M90 MTU 16 cylinder diesel engine 16V 4000 M90 Maintenance (Service / Repair) Manual and Technical information, Spare parts catalog, Operation manual. 178542 V4000R20 MTU 12 cylinder diesel engine 12V 4000 R20 Maintenance (Service / Repair) Manual and Technical information, Spare parts catalog, Operation manual. 178543 V4000R40 MTU 8, 12 and 16 cylinder diesel engines 8V 4000 R40, 12V 4000 R40, 16V 4000 R40 Maintenance (Service / Repair) Manual and Technical information, Spare parts catalog, Operation manual. 178544 V4000R41 MTU 8, 12 and 16 cylinder diesel engines 8V 4000 R41, 12V 4000 R41, 16V 4000 R41 Maintenance (Service / Repair) Manual and Technical information, Spare parts catalog, Operation manual. 178545 GV4000 MTU 16 cylinder Gas diesel engine G 16V 4000 Maintenance (Service / Repair) Manual and Technical information, Spare parts catalog, Operation manual.